During the past few days of being jobless I have been keeping myself by watching some good Japanese Animation or anime. I was watching Shaman King, an anime series which I didn't have the chance to finish watching during high school because my life was dedicated to studying back then (ewe... how nerdy hehehe). Anyway I'm almost finish watching Shaman King and what could I say? It's a great anime! Some people would say that anime are just for kids or it's nonesense but it does have some special messages like do what you must to achieve your goals, but never ever think that it's ok to step on anyone to reach your goals. 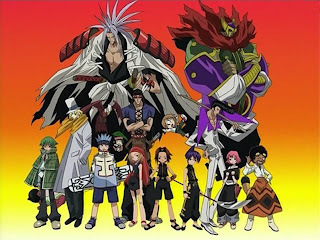 I know, it's not that inspiring coming from me but watching Shaman King is inspiring for me and it fits the genre of the movies and games that I love watching and playing: fantasy & supernatural. It is through watching anime that I am released from this world, worrying about nothing. But I do know that I need to face reality, such a troublesome fact.